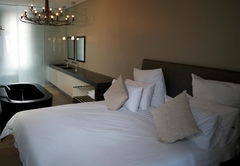 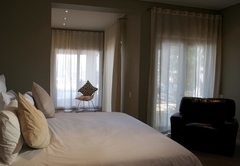 24 Loader Street is a property providing self catering in De Waterkant for up to 6 guests visiting the City Bowl region. 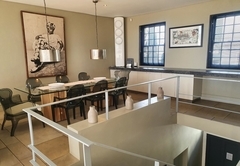 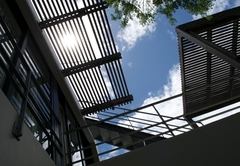 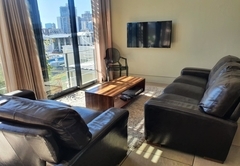 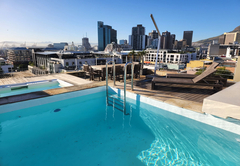 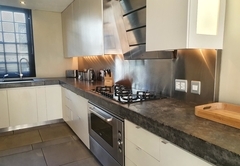 24 Loader Street is a great house for families or friends looking for Cape Town accommodation. 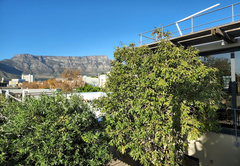 This traditional large property in appearance from the outside, is modern and stylish from within and boasts one of the highest roof terraces with the best facilities in the area. 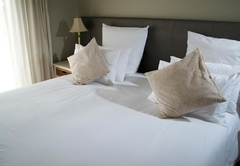 The air-conditioned bedrooms are all located on the ground floor. 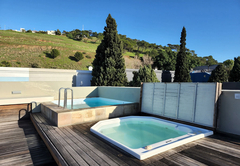 The Master bedroom with glass walled toilet, open plan en-suite bathroom and free standing black bath and shower has a large dressing area and like the second king / twin bedroom opens out onto a garden with pond, seating and great views of the Harbour and city. 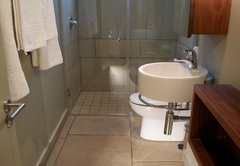 The third compact double bedroom shares a shower bathroom with he second bedroom. 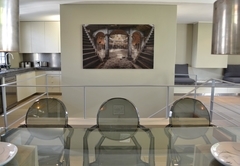 Stairs from the front door lead you directly to the first floor which is the entertaining heart of the property. 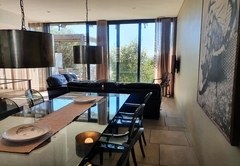 Beautiful finishers throughout, this massive air-conditioned open plan dining, living and kitchen area has floor to ceiling sliding glass doors along one whole side that look down on the garden and across to the harbour. 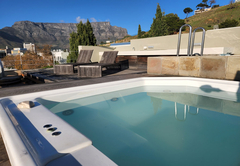 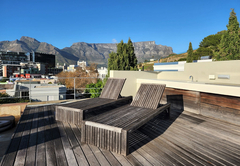 Exterior steps lead you to the roof deck with spectacular 360 degree views of Table Mountain, Signal Hill and the whole city. 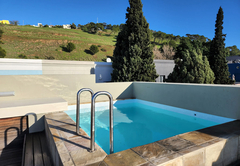 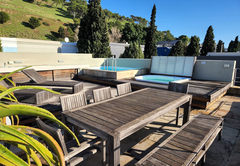 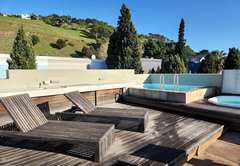 With it's plunge pool, Jacuzzi, sun deck, seating and bar counter with sink and built in Braai / BBQ this space is ideal for relaxing or entertaining. 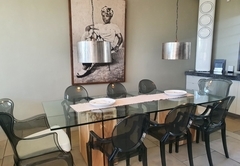 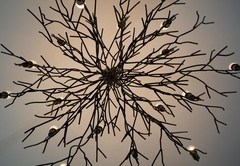 The cottage offer space, privacy and home comforts; each is cleaned six days a week with a light service on Sundays, with the exception of public holidays. 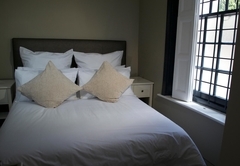 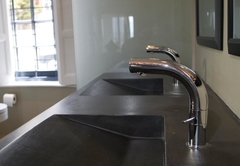 All bed linen and towels are provided and the kitchen is fully fitted and there is complimentary tea and coffee to get you started. 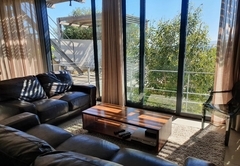 The property has satellite television, DVD, music systems, and a manual wall safe. 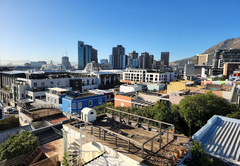 Response time24 Loader Street typically responds to requests in 5-10 minutes.